How did this happen? This morning I woke up (and it’s always an occasion for celebration when you do wake up in the morning) and suddenly I was 49 and peering over the cliff at an approaching 50. Where did my forties go? It just seemed like a short time back that my family surprised me with a 40th birthday party and then 9 years just flew by. I wonder if it has dawned on my wife yet that she is going to be married to a middle-aged man soon? Speaking of middle age, I’ve deferred it a number of times. Someone once declared it started at 35 and I decided that was silly and pushed it off to 40. When I turned 40, everyone was talking about how people were living so much longer and I thought it was a safe bet to push it off to 45. When 45 got here, I was stretching things but managed to get one more deferral. I don’t think I’m going to get another pass on officially entering middle age. By my seriously flawed reckoning, which includes a combination of mathematics (which I took to like a cat to water) and some kind of fuzzy actuarial formula that I came up with on a napkin, middle age is officially coming. Ok, who am I kidding? It got here some time ago but I’ve been living in a state of denial. My youthful enthusiasm and energy is fueled more by coffee these days than anything else and it tends to run out about 2 PM. The Keurig has become the fountain of youth in my life. That and my son, who is now 10 and soon to be 11. I think having a young child with endless energy helps a lot but with age differences, you start to put things in perspective when thinking about how things could have been. When my Dad turned 50, I was a month away from my 30th birthday. When I turned 30, my mother turned the same age I am now the next day. I can’t even fathom the thought of physically being old enough to have a 30-year-old son. 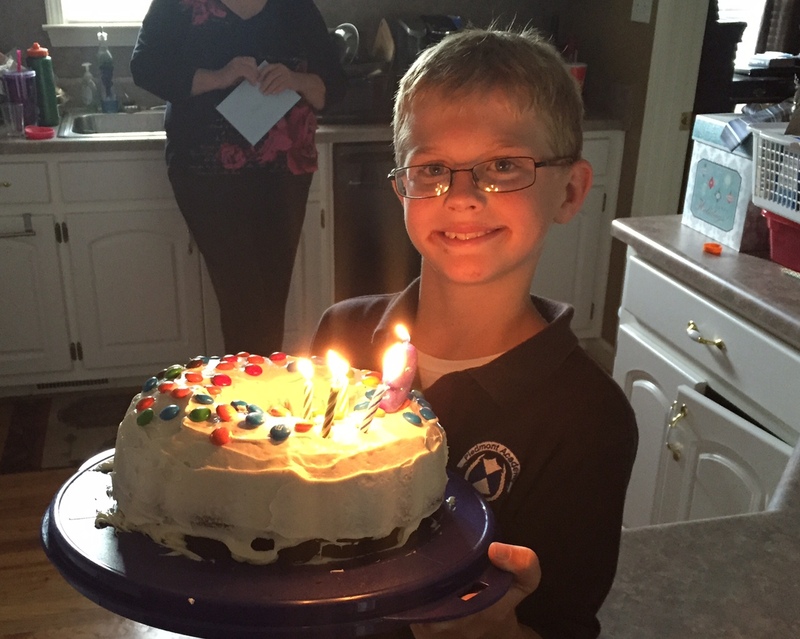 I’m still trying to wrap my brain around having a 10-year-old son. Using my parents as a model, I am technically old enough to be his grandfather. Then instead of being an “old” dad to him, I could have been a young grandfather. That wasn’t the plan though and I’m kind of glad I things worked out the way they did. I guess when it all boils down to it, the facts are pretty clear. I have one year of 40’s left to me. What do I do with it? What things did I want to accomplish before 50 that I haven’t done yet? I’m not likely to get that first novel pumped out before 50 so maybe I should look for other things to do. Not a bucket list mind you. God willing, I can stretch middle age out a long time too. I don’t want to bungee jump and I don’t want to skydive. My wife did that and if she wants to jump out of a perfectly good airplane, that’s fine with me. Flying lessons would have been fun but now that I have a wife and a child, I’m content with not doing things that might get me killed or put others in harm’s way. I thought about cooking classes but after binge watching Hell’s Kitchen on Netflix, it reminded me of all the reasons I didn’t get involved with the family restaurant business. So I’m kind of at a loss. What do I do over the next year? What have I done over the last nine years that will mark my 40’s? I started to write. Starting to do that wasn’t easy but once I got started, it became easier. I began this blog 5 years ago and that has been both rewarding and fun, when I don’t neglect it. Work demands often use up brainpower that I need to craft words into coherent sentences and if I have noticed anything about adding another year to the stack, it’s that I don’t have as much as I used to and I need to use it wisely. I plan to make time for writing a priority over the next year again. There are still stories and experiences in my head that need to be put down in words and some interesting characters in memories that I want to bring back to life, some of whom will be familiar to a lot of my readers. If writing is a gift and gifts are meant to be shared, then sharing their stories should be a priority. Some of them are gone now but they live in my memories and should live where others can enjoy them too. Next year may be the “over the cliff” year for me but I hope there will be a few more of those cliffs. I had lunch with a friend today who told me that her 50’s had been the most enjoyable of her life. I think it all comes down to what you do with them and I hope to put mine to good use once they get here but first, I’m going to savor and try to enjoy this 49th one and make it meaningful somehow, even if it’s just one word at a time. Maybe I’ll find something to do not quite as dangerous as bungee jumping. One thing I’ve already enjoyed was all the birthday wishes I received today. Facebook is many things but one nice thing about it is that on one day of the year, you hear from a lot of people who stopped for a moment and thought enough to send a greeting. That has really made it a special day…that and waking up. I’ll try not to take that for granted, ever. Thanks for letting me occupy a few minutes of your day with my blogs and posts. As I like to say, it’s very much appreciated! Happy birthday Michael. As long as you’re peering over the cliff, you haven’t gotten close enough to fall over. May that day be a long time off. Thank you Mike…one thing about cliffs is that it’s good to tie a rope to something and hang on. Thank for reading! Perspective, Michael, perspective is what you need to have for your 49th year. I remember when I thought 50 was “the cliff”, but it’s amazing how young it sounds when you’re pushing 70. Enjoy every day on the green side of the grass, no matter what cliff you are facing. You could always start on that novel even if you don’t pump it out by 50. Have a splendid 49th year, whatever you do with it! Well said and much appreciated advice Pat…thank you as always for your readership! Having turned 50 myself 14 years ago, I can assure you that it is much more like a gentle slope than a cliff. Happy Birthday, Michael and I certainly do hope you find the time to write more. Your gift for it is quite evident. I am grateful for the day my brother sent me your post about Mr. Roy’s barbershop and I became a regular reader of your blog. You have a way of making my childhood come alive again with the sights, sounds, and characters of Jackson and Jenkinsburg. Thank you and I really appreciate the good feedback! I certainly plan to keep on writing and hope my brain and eyesight will hold out to get it all done! You are still a very young man. You should use a more updated algorithm. Call MIT. They should be able to help! Enjoy your youth…whooper snapper!!! Happy birthday! I’m just a year behind you. These years are the best of my life, and I trust these years are the same for you, too. Many thanks Jim…I’m going to plan for them to be!